Last year, we at Filipino Bloggers Worldwide held our very first grand eyeball. And although it wasn't a flawless event, it was thankfully a success. We, the admins, wouldn't be able to do it though without the help of our group's volunteers. 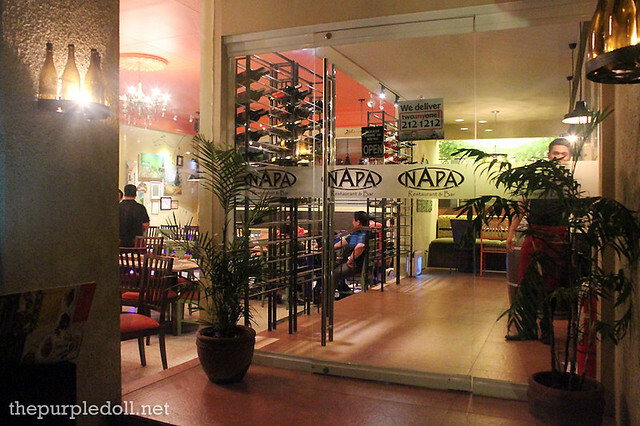 So to both give back and celebrate, we went to Napa Restaurant & Bar in South Triangle, Quezon City. Located specifically along Scout Borromeo St., Napa Restaurant & Bar is an American-Italian dining destination inspired by Napa Valley built on what was once a house. 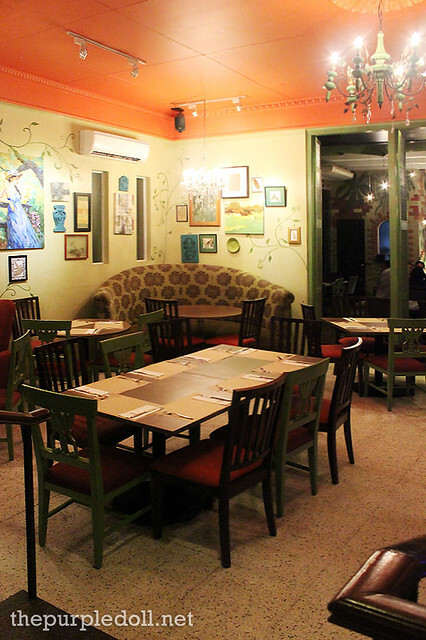 Now, it's a homey and cozy haunt lined with potted plants, rustic accents and quirky woodwork with dining spaces to suit every occasion. There's seating perfect for dating couples, long tables for families and barkadas, and even a function room for business meetings. Napa Restaurant & Bar is really unlike any other dining spots I've been to. Upon entering you'll already be welcomed by a quaint ambiance. And since every nook and corner has a different setup, it makes staying all the more interesting. For our visit though, we had a table at the farther end of the restaurant, beyond a pale green wooden panel divider, near the glass desserts chiller and Napa Restaurant & Bar's brick oven. Since we were waiting for some more of our companions, I took the liberty to tour the vicinity. I found it curious that the indoor dining area speaks nothing of a bar but of a full-blown restaurant, or maybe a café. But when I went to check the al fresco section, I found the bar side of Napa Restaurant & Bar. 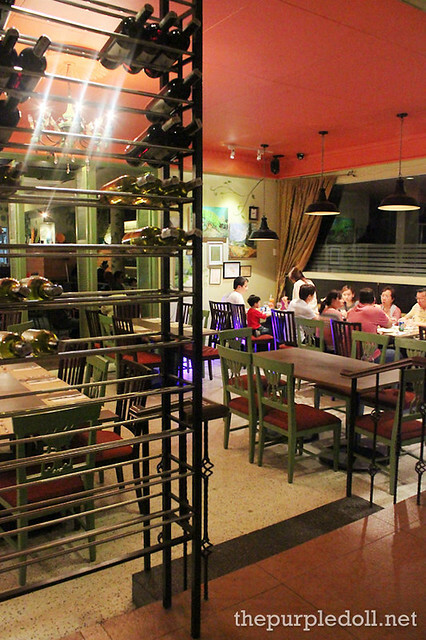 Unlike most bars with dim lighting though, Napa Restaurant & Bar sports a more earthy yet still fun atmosphere. And since it's outdoors, friends can drink, chat and laugh the night away to their hearts' content. Of course, ambiance is an integral part in a dining experience, but it's still the food that will determine if a dining destination is worth coming back for again and again. 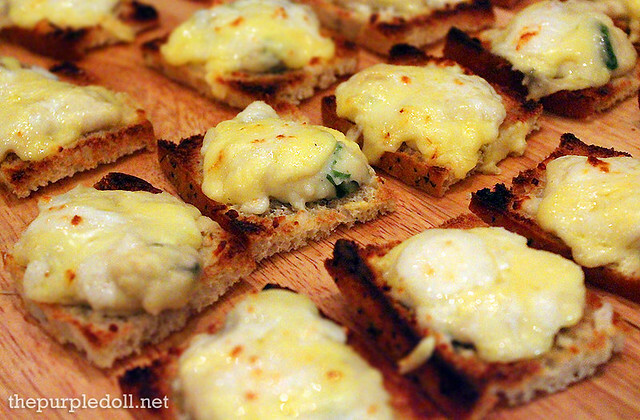 So let me share with you the dishes we had for the night, starting with these appetizers. 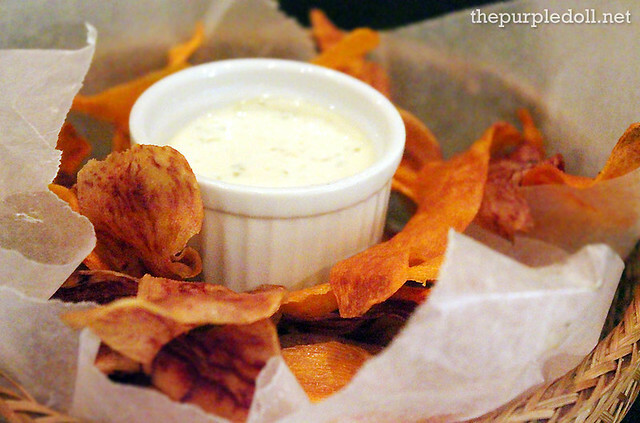 First on our table was the Veggie Crisps (P165). These pieces of thin, crisp-fried yellow and purple sweet potatoes may look ordinary, but they were far from being greasy and were really good! Served with a capers-mayo dip, I can't help but get a piece after another. Seriously, I think I ate more than half the basket since it was just so addicting. Next, we had the Cheesy Chicken & Spinach (P270), a creamy dip made from 4 kinds of cheeses -- cheddar, emental, blue cheese and mozzarella, with chunks of chicken and spinach. This item normally comes with focaccia toast, but since we're quite a big group, they were kind enough to have served the dip already on pieces of toasted bread. 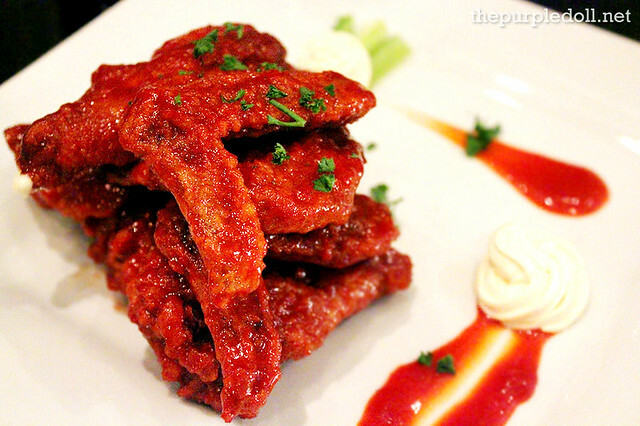 We were then served with the Buffalo Wings (P235) which are crisp-fried pieces coated with a special chili-buffalo sauce that tasted sweet, tangy and hot all at the same time. Served with sour cream and celery sticks, this is a flavorful appetite whetter for the gang. After tickling our appetites and palates with the meal starters, we then moved on to the mostly American-influenced mains. And while there were interesting fish dishes on the menu, it was but natural that we went eyeing for the grilled meats. 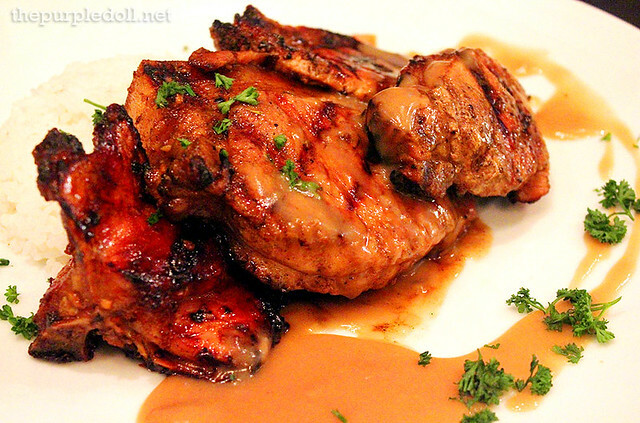 First main dish we had was this plate of Pork Chop Grande (P450). Served with a choice of 2 side dishes, which in our case were steamed rice and butter vegetables, these thick, juicy and succulent pork chops were marinated in Napa Restaurant & Bar's special spice mix, grilled, then drenched with a wine reduction sauce. We also had the Sicilian Chicken (P420) -- a plate of juicy chicken breast marinated in a flavorful blend of spices then slowly grilled and finally topped with fresh salsa. Served with buttered vegetables and mashed potatoes, this chicken dish wasn't only filling but very palate-satisfying. Even the mashed potatoes made a lasting impression on us. Since we didn't quite get our necessary dose of carbs, our group shared servings of the more Italian-influenced items on Napa Restaurant & Bar's menu. After enjoying the tender, succulent and meaty mains, here comes our pasta, pizza and panizza. Our pasta for the night was the Pasta Gamberi (P360) -- a pomodoro sauce-based pasta dish with plump shrimps sautéed in garlic, chili and olive oil, served with spaghetti. 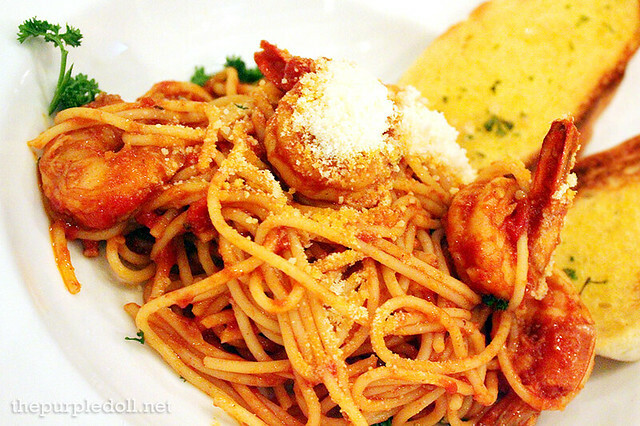 While it was quite disappointing that the spaghetti wasn't cooked al dente (it was quite soft than how it should be), I was really happy with the sauce and the shrimp topping. I liked that it was a little savory and tangy with a slight kick of spice at the same time. 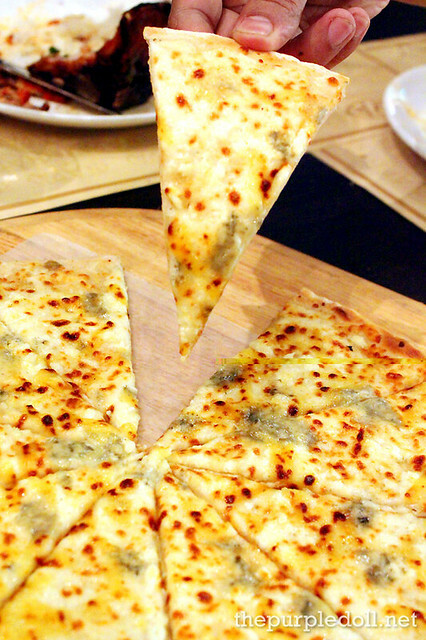 For pizza, we had the Cinco Formaggio (P420), brick-oven-cooked Italian favorite with 5 kinds of cheeses -- cheddar, swiss cheese, blue cheese, mozzarella and kesong puti. 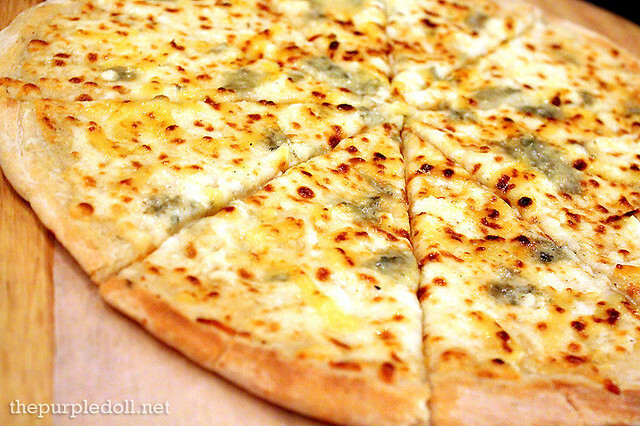 While this pizza is definitely one cheesy food item, I have to note that the thin crust is more chewy than crispy. I quite dig chewy pizzas though, so it wasn't a problem for me. 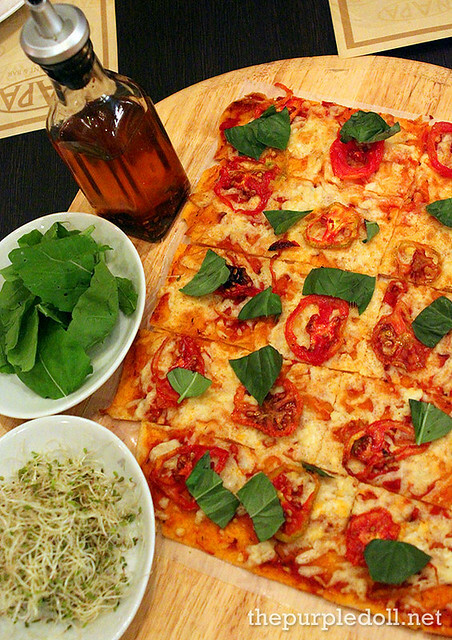 Next, we had the Vegetarian Panizza (P395), a classic combination of pomodoro pizza sauce, mozzarella cheese, sun-dried tomatoes and arugula pieces. 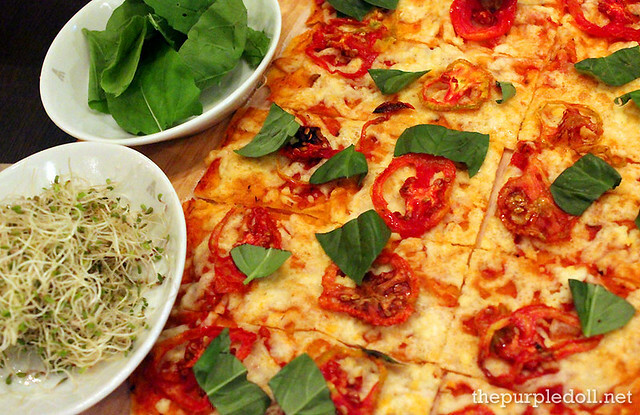 Since this is a panizza, it was also served with alfalfa sprouts, more arugula, and a bottle of chili oil. 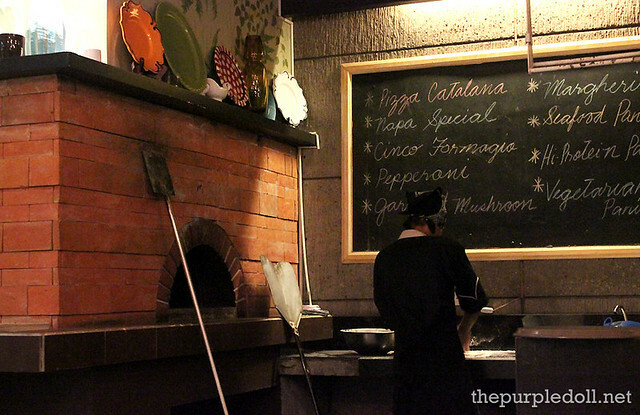 If it's the first time you've heard of panizza, then let me enlighten you a bit. 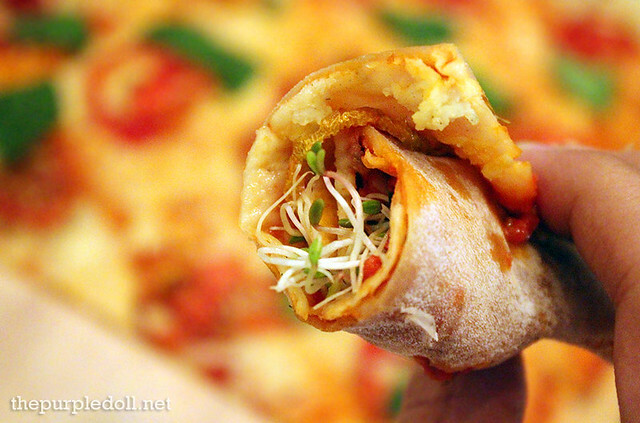 Unlike regular pizza, a panizza comes with extra toppings or filling, in this case, arugula leaves and alfalfa sprouts which you roll into a slice of the panizza before eating. Think Yellow Cab's Dear Darla. And if you're like me who loves an extra kick of spiciness, then be sure to drizzle some chili oil before rolling up your panizza slice. Yum! Even though it was my first time at Napa Restaurant & Bar, I can't deny that I've already heard quite a buzz for this dining destination's sweet endings. So even if we're almost full, it was mandatory that we make space for their raved desserts. 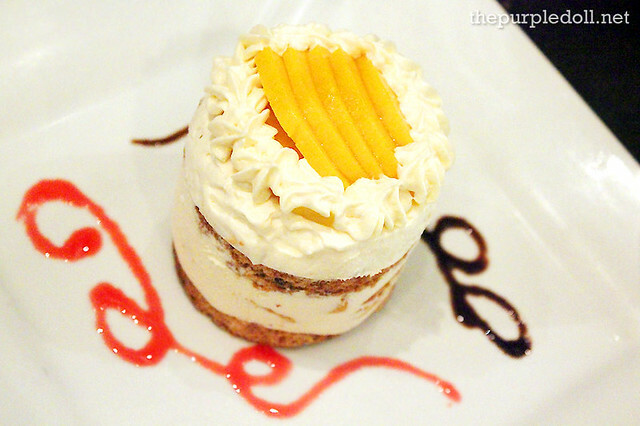 Our first treat for the night was the Mango Torte (P165) -- a tower of layers of cream and crisp wafers loaded with cashews, walnuts and topped with mangoes. It looked pretty on the plate, but it was more beautiful on the palate. Upon my first spoonful, I can already enjoy the crisp and chewy layers which reminded me strongly of sans rival cake. Only this time, it didn't have pistachio nuts and made use of mangoes. 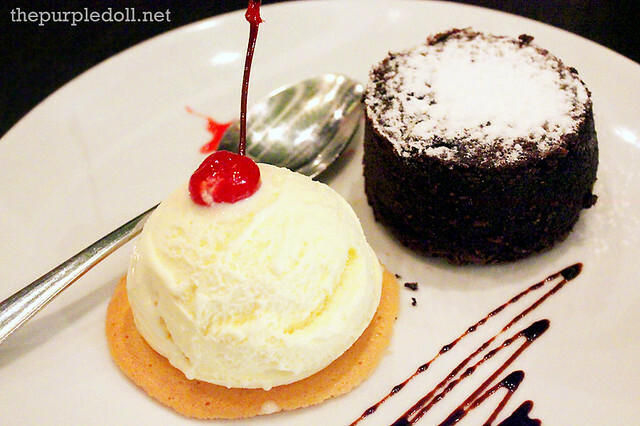 We also had Napa's famous Lava Cake (P190), a rich and moist chocolate cake that oozes with thick chocolate syrup. Served with vanilla ice cream on the side, there's nothing not to love on this plate. Every spoonful gave me a warm and fuzzy feeling inside. Actually, even without the ice cream, I'll gladly take on the cake! There was a however moment with the Lava Cake though. Since we had 2 orders, I noticed some inconsistencies. While the first cake which I got a bite from was perfect, the second one was cooked all the way through so it didn't have the oozing chocolatey goodness. Nonetheless though, my companions seemed to have still enjoyed the chocolate cake. After enjoying our lovely and very filling American-Italian dinner, of course it would be a sin to miss the photo op. 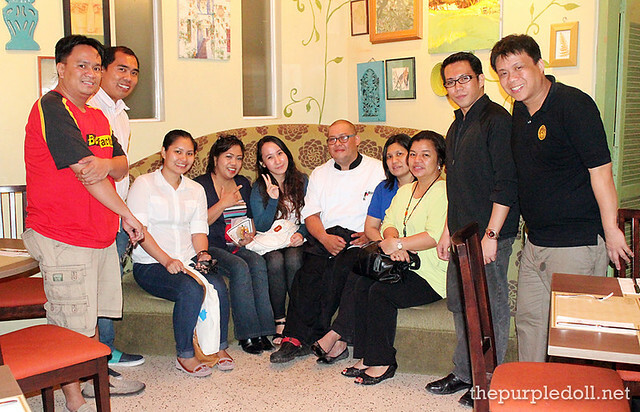 So together with Chef Joseph Apolinario, we made sure to have our group picture taken on the quirky couch by the frame-adorned walls. And to Direk Rich Ilustre and the whole Napa Restaurant & Bar team, thank you so much for hosting this wonderful meal for us. We are very grateful, and we really enjoyed every bit of it. Now, if you're planning to visit Napa Restaurant & Bar any time soon, why not do it this Valentine's Day? If you still don't have a restaurant to bring that special someone to, check Napa's V-day menu. It might just be the perfect romantic set for you. If you reside or work near the area, and want to check out Napa Restaurant & Bar's offerings for lunch, then this is for you. 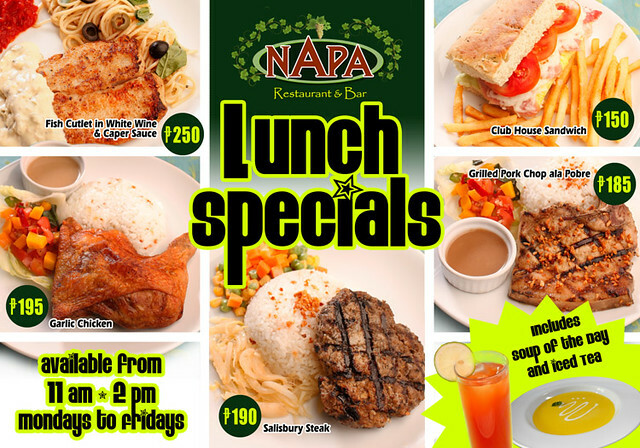 Whether you want to dine a la carte, treat your loved one this Valentine's Day, or eat an American-Italian lunch, I'm sure Napa Restaurant & Bar has something to offer you. Although this is my first trip ever to Napa Restaurant & Bar, I just know that it won't be the last. Sure, not everything we got to try impressed my palate, but let me tell you that there were dishes that really stood out and won me over. And with a really warm and cozy ambiance, prompt and courteous service, a wide American-Italian menu, and reasonable pricing, a visit to Napa Restaurant & Bar will always keep me wanting for more. Too bad I missed this event but the place really looks impressive and the food are classy. Hope to try the place in the future. Place is accessible and the food looks very good. Are those entrees good for sharing or just for one person? In the Valentine offer, is the P950 menu good for sharing between two people or is that per person? The entrees are already good for two :) But of course, if you're really really hungry, it's the perfect portion size for one! 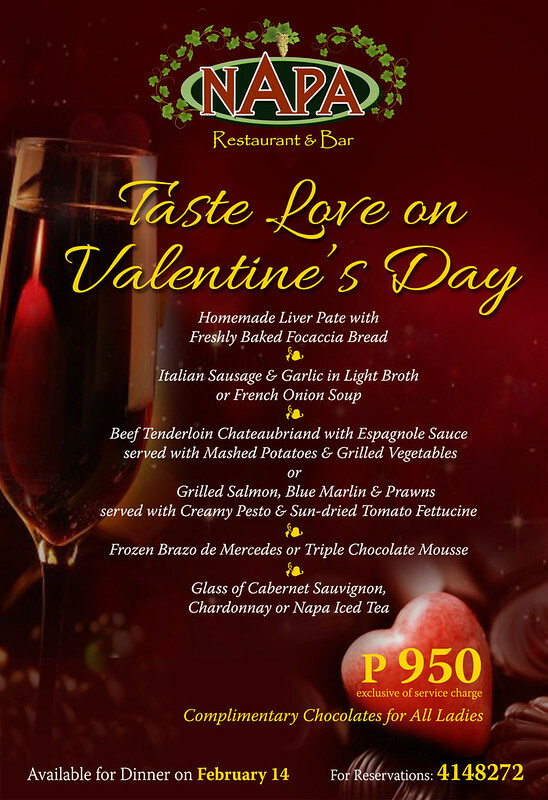 :D Btw, the Valentine offer is P950 per pax. It's already a filling set though ^^ Cheaper din compared to most restos which have over 1k per pax rate. Nice! The food looks good! I'll drop by soon :) OMG! 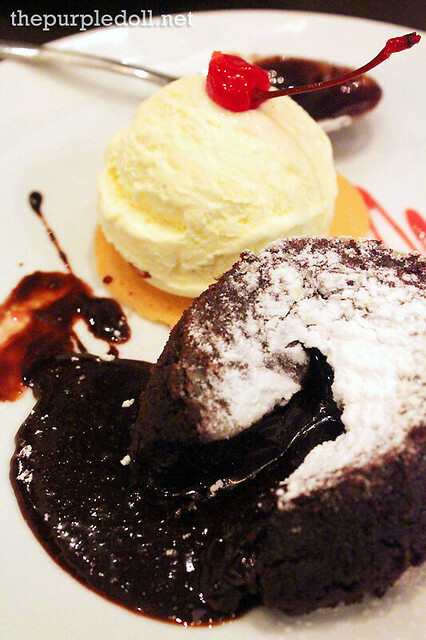 The Lava cake! This place looks posh. The price isn't that expensive. I hope I can go there in one of my vacay to the Philippines. I love spicy food including loads of tabasco on my pizza so I find panizza really interesting concept. Do they serve tiramisu? i love that dessert in any Italian diner. I went to Napa once and yes, I checked out their brick oven too! The panizza looks promising! And of course, I love desserts so I would have that Mango Torte, please. Nice Place. Hope i can visit and taste the foods! I'm drooling -_- I'going to try Pork Chop Grande, Sicilian Chicken, Mango Torte and Lava Cake when I got there. Even though it's quite far, I think it's a must-try! Wow the dishes are really mouth watering! I love chicken i want to try their buffalo wings and the yummy LAVA CAKE.. I really love to try their pizza! big servings ba yung main dishes nila Sumi? Wonderful post! I see this site and very glad to thanks for a nice site creating. Here all information is very important for me and mostly California is a great placed it is proved by this site. Traffic school in napa On the internet site visitors school choices are incredibly effective in case there is hazardous occasions nonetheless there is time involving pressure, anxiety and panic, inappropriate insight and additionally slipups created by others. Get Ready for UP Economics Society's FOODGASM 2!